John is an artist, visualist and entrepreneur. 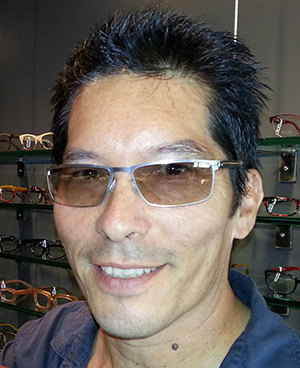 He started his career in the optical industry 20 years ago and since that time he has perfected the art of fitting frames and cutting even the most difficult of lenses to idealism. John knows people and strives to make their experience one of superiority. John's experience with building gives him an interesting perspective on his handling of lenses and frames. He likes to try new things and push limits making glasses even more individual than just the frames alone, you could say he tailors lenses to each individual's needs and wants. Rarely did I ever hear him say "I can't do that" -Joanne Mountain.